Bonnie Fishburn’s Blog: A lesson learned and some sparkly news! Read Bonnie’s Happy New Year message, who shares exciting news about two sparkly additions new to her life! Firstly, I would like to wish you all a Happy New Year and I hope Santa was kind to you at Christmas. Last time I wrote I had just got back off holiday in November. Since then things have been a little bit quiet on the competing side of things because the horses have their holidays and then when they do come back into work – usually in December – we are concentrating on getting them fit, so many hours spent out hacking. This year was a little bit different for a couple of reasons. The first being that I had won a lesson with the amazing Jock Paget. When I found this out I hadn’t got any horses in work so Percy had a week to get ready for his lesson and of we set to Lincolnshire. I had a great lesson and Jock gave me some great pointers. Everything he said made sense and by the end of my lesson Percy was going fantastically well and had changed so much. The second reason why this year is different is that both Florence and Percy had qualified for the British Showjumping 95cm Amateur Championships having gone through the first round stages and qualifying at the second stages. The championships were held at Aintree which is an amazing venue. Both horses had been on their holidays and then put back into work and this was their first competition for about seven or eight weeks. At the championships you jump in two classes to try and qualify for the Grand Prix on the Sunday. We had a couple of very early starts, but both the ponies were fantastic. Each jumped a double clear both days, qualifying for Sunday. Although we were jumping double clears we were outside the placing’s on both days, I was amazed just how fast the show jumper’s go in the jump off and of course with my eventers we don’t really learn to jump off. This was the deciding factor why I didn’t go back to jump on the final day, 48 had qualified from the original 106 and I just thought it was a lot of money to go back and probably not stand much chance in the jump off should we get that far. So instead the horses went out in the field and I watched the class on the Internet. I learnt a big lesson this day: You have to be in it to win it! To my horror I watched only 22 go clear and into the jump off, of which only three were clear! So if I had gone and popped a couple of nice double clears I could possibly have been 4th and 5th. The course just caused so much trouble, there were fallers and stoppers and poles flying everywhere. 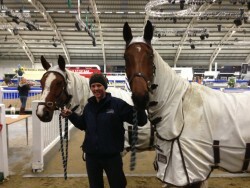 I know I can’t say I would have jumped double clear on either of them but if we had we could have had a great result. However, they both jumped fantastically over the two days and despite being a little bit down having watched the class on live stream, all was not lost though as Thomas, my boyfriend, proposed to me that afternoon, so I’m now engaged!! 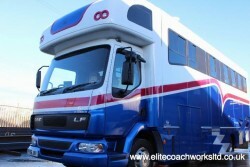 In December I became the proud owner of a beautiful new Elite Coachworks horse lorry. She has been christened Queen Wendy the Wagon. It has been my dream to one day own a lorry but I never thought I would be able to have a lorry as beautiful as Wendy. She is a 12 tonne DAF LF and carries four horses. The living has everything I will ever need including a luxury bathroom, cooker, microwave, three beds, TV, fridge etc., and there is a massive underfloor storage area. I’m so excited for next season; I’ve always been the odd one out at big events in my trailer and having to set my tent up! It’s now the beginning of January and its full steam ahead with all four horses back in work and getting ready for my first couple of competitions of 2015 this weekend.